In past posts, we’ve talked about trade policy causing short-term volatility in the markets. Canada’s announcement of new tariffs on Monday has rattled the market. Expect trade and tariffs to continue to stoke volatility, but when it comes to your asset allocation, think strategically. Headlines and isolated data points can dominate the markets on a day-by-day basis. But no single force drives the markets over the long term. I’ve been investing for nearly 50 years, and there’s never been a time when the environment has been perfect. Successful investing is about looking at how all the underlying data comes together. It’s about balancing the positives with the negatives. As we discussed last week, although the bull market and current business cycle are maturing, we don’t see a recession right around the corner. Some economic data is softening and policy in some areas (certainly trade) may create short-term headwinds, but there are other offsetting factors at work. For example, in the U.S., tax reform and deregulation have provided a wind in the sails for individual businesses, and by extension, the business cycle and bull market. (I’d note that the effects of less onerous regulation and reasonable taxation could likewise benefit European economies where there is a need for reform.) 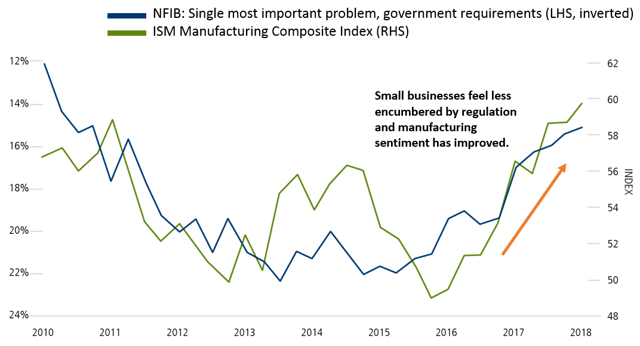 Figure 1 charts small businesses’ view of regulation and the outlook for the manufacturing sector. The percentage of small businesses ranking government requirements as the most important problem has declined, and we also see manufacturing sentiment climbing upward since 2016. Monday’s announcement of ISM manufacturing data for June furthered the positive trend, with a value north of 60 coming in - ahead of expectations. Source: Berenberg Capital Markets, Dr. Mickey D. Levy and Roiana Reid, June 29, 2018, using National Federation of Independent Business (NFIB), Institute for Supply Management and Berenberg Capital Markets. The NFIB compiles data on small businesses. The ISM Manufacturing Index measures confidence in the manufacturing sector. Levels above 50 are considered indicative of expansion. As the economic cycle and bull market continue to run their courses, take some time to make sure your asset allocation aligns with your long-term goals. For example, in a market environment that’s likely to be choppy, this could include balancing growth equity allocations with lower-volatility strategies, including liquid alternatives and convertible securities.